A special visitor recently arrived at Brookhaven National Laboratory after a weeks-long cross-country trek, requesting a homecooked meal and shower, probably. 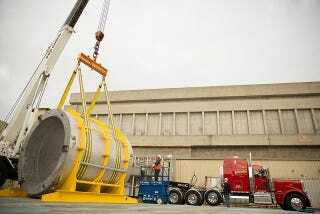 The 20-ton superconducting magnet is called the BaBar magnet, and it was recently transported across the country on the back of a truck from Stanford’s SLAC National Accelerator Laboratory in California. In New York, it’s going to start its second life—as the crux of an important update to the PHENIX detector at Brookhaven’s Relativistic Heavy Ion Collider, where physicists will use it to study smashed atoms and glean new insights about matter and the universe. BaBar arrives at Brookhaven Lab, via Brookhaven National Laboratory on Flickr. In the end, BaBar arrived safely. “It was pretty unreal to finally see this amazing piece of machinery arrive safe and sound at the Lab’s main entrance,” said the physicist in charge of the process, John Haggerty, in a statement on Brookhaven’s website. SLAC on Flickr and Symmetry Magazine. Photo by Andy Freeberg.